I’ve been trying to find a reasonable breakfast since I arrived at the Hotel, but I’ve been unable to find a cafe or diner to eat breakfast. I suspect that part of the problem is that there are some breakfast places, but since I don’t know the the reputation for some of these chain restaurants. As a result, I’m sure I’m missing a few places that might work, but they certainly didn’t stand out. 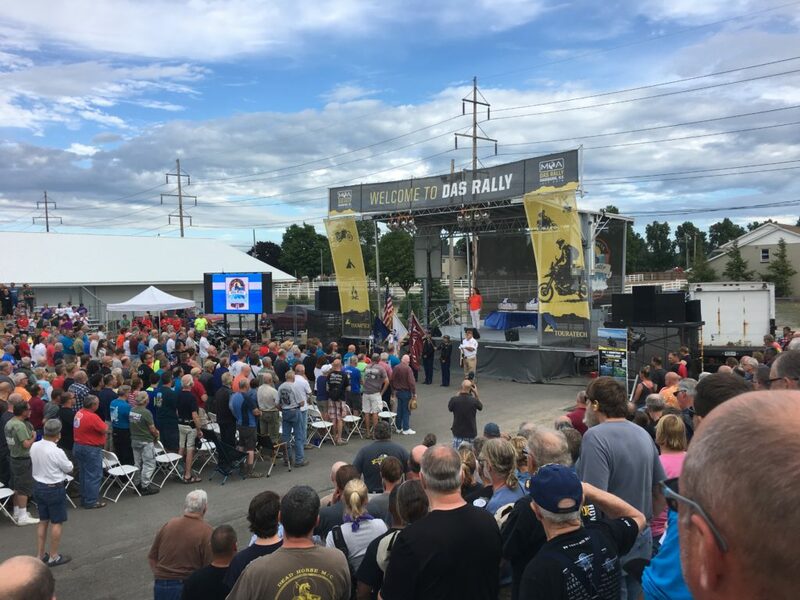 Yesterday I tried eating breakfast at the rally, and it wasn’t a bad breakfast, but paying $15 for a very limited buffet seems a bit high-priced for a motorcycle rally. So, today I resorted to a tried and true breakfast spot. Panera Bread. Panera is always good, and they have Hazelnut coffee. So, all of the boxes are checked, and I can get a good breakfast at a reasonable price. I arrived at the rally by 8:15 or so, and had to wait for the expo floor to open. At 9:00 AM the doors opened, and I went in to visit the folks at Sena, to talk about my communicator. After getting the new helmet from Touratech, I needed to install the communicator onto and into the helmet. The process is generally not hard, but I usually like to take my time, and be 100% sure that I’ve chosen the right options for the install, and installed it so that I don’t have to un-install it, and make changes. The Sena S-20 comes with three different microphones, any one of which can be used, depending on the helmet you’re installing into, and your personal preferences. For my helmet, there were two options. Both of these options connect the microphone to the base unit by wire, but one of them has a boom mike that needs to be installed behind the Right cheek pad, and the other is a small condenser mike, that is installed into a detent inside the front of the helmet, near where my mouth will be. The folks at Sena noted that the boom mike offers better sound quality, so I decided to install that option. It’s more complicated and it took me about 30 minutes to get everything installed. I’ll bet that a good number of you readers are surprised to hear that I attended a seminar about GPSs. Well, sorry to disappoint you, but I actually attended two seminars about the BMW Navigator V GPS, and another that talks about the subtle differences between tracks and routes. If I continue to talk about this, I’m sure I’ll have some folks falling asleep, so suffice it to say, I learned a great deal, and have put some of it into action already, while other information about GPSs will be used the next time I create routes. By this point in the weekend I had been mulling over the question of buying a new rear tire, or not. I decided that I would replace the Heidenau with a brand new Michelin Anakee Wild, hoping that it solves the handling problem. The cost of a new rear tire was about $320, but at the show they are offering the tire at 20% off, with free mounting and balancing, if the tire is off of the bike. So, I bought the tire, and retrieved my bike from the main parking lot. I rode it into the service area, put it up on the center stand, and had the rear wheel off in about 3 minutes. They took less than 30 minutes to get the tire changed, and I had it installed back on the bike within an hour. During the ride home, I could definitely feel a difference, but there were so few curves in the road between the rally and the hotel that it wasn’t really a fair test. So, I would need to wait until I was on my way to PA or VA before I would get a chance to test it out. The old tire had only about 6000 miles on it, and I would expect it to last at least 8000 – 10,000 miles, so it’s still got life in it. I decided to take it back to the hotel with me, and figure out how to carry it on Sunday morning. The picture below is what the bike looks like when loaded with the tire on top of the spare gas cans. One thing about the MOA rally is that they receive tremendous support from the sponsors. In fact, the sponsors usually donate as much as $80K in goods and services to be raffled off. This picture shows the view of the main stage, from my seat in the bleachers. The closing ceremonies took about an hour or so, and during that time they pulled about 25 winning tickets from the bins. It is with great regret that I must report to you that my name, and my number were not part of any of the tickets drawn. It’s a shame really, because I had already begun planning for the trip called “The 7 countries of Yugoslavia”. Imagine, riding around Croatia, Slovenia, Bosnia, Servia, Macedonia, Kosovo, and Montenegro. Wow, that would have been an awesome trip to do on a bike. Sadly, the rally is over, and it’s time to head out on the road again. This time, I’m heading to Virginia, where I’ll hang out for 2 days with some old friends. Having visited Croatia a couple of years ago, I can assure you that it would indeed be awesome. My bucket list trip is a dirt bike adventure in SE Asia though. We toured through the area and being able to ride a bike to all of the Angkor temples in Cambodia would be something special. Sadly, I did not win the trip, so I’ll need to plan another excellent adventure, using my own money. Ouch, it hurts already. Muuuuuuuuuus! There you are. I’m so glad to read about the rest of your journey and know your’e well. What an adventure. I’m glad you were able to stop and hang for a while in Denver. Give me a shout when you get settled. Thanks for the hospitality while I was in Denver. I’ve been pretty busy with the last 30 days of the trip, so I hope you can forgive me not responding to your TXT message. In any case, I’ll give you call in a couple of days to get caught up.